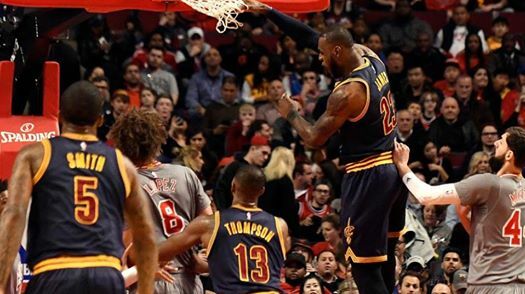 LeBron James has made another individual achievement in statistics as he continues to move up in the NBA All-time Scoring List after scoring 26 points in a losing effort against the Chicago Bulls. James, who is now at 7th place has passed one of the greatest and dominant center in the history of the game, Hall of Fame, MVP and 4 time NBA Champion Shaquille O’Neal. James starts the game with a terrific performance in the 1st Half scoring 19 points and showing some series of powerful dunks, but on the 2nd Half James only contributed 7 points and missed some crucial free throws that leads to their 3rd straight loss that put the Cavs (47 -27) 2nd in the Eastern Conference Standings after the Boston Celtics (48 -27) as the season nears its end. James finishes the game with 26 points, 10 rebounds and 8 assist shooting 11/20 in the field and continues his struggle in free throws shooting 3 out of 7. With 4:28 remaining in the 4th Quarter James made 1 out of 3 free throw to officially pass Shaquille O’Neal on the scoring list, which now put him in 7th place and with a new career total points of 28,599. James is more likely to end the Regular season through the playoffs at the solo 7th place and will be chasing next the Dallas Mavericks superstar Dirk Nowitzki which is currently in 6th place All-time with 30,181 career points. Dirk Nowitzki a former MVP and an NBA Champion is the only remaining active player in the list that LeBron James is chasing and is expected to pass next season? Aside from chasing Dirk? James is also aiming the 30,000 points that will put him as the youngest NBA Player and 7th member of the said milestone. After Nowitzki the next top 5 on the list is also happens to be the Top 5 greatest players of All-time. Wilt Chamberlain, Michael Jordan, Kobe Bryant, Karl Malone and currently the most career points in NBA History Kareem Abdul-Jabbar. No Comment to " LeBron James Moves Up to 7th in All-time in Scoring List, Pass Shaquille O’Neal "